Toronto-based baritone saxophonist David Mott is one of my favourite musicians, and one of my favourite people in the music business. I know a couple of the other guys in this band, too, so this is in no way an unbiased review, but that doesn't change the fact that this is an exceptional recording. 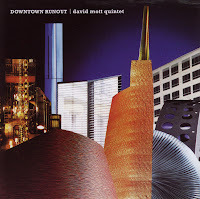 I heard the band improvise on the some of the 11-part title suite, "Downtown Runout," at the Vancouver Jazz Festival a number of years ago, and it's the kind of multi-layered, pace-shifting piece that Mott excels at. He is a brawny player, but also has tremendous sensitivity, and when he plays the blues you can tell that he was born in Chicago. Bassist John Geggie and drummer Jesse Stewart – my other two acquaintances in the quintet – are a very supportive, creative rhythm team, and this music brings out Geggie's ability to just crush a funky ostinato. It's a skill of his little heard since he anchored the quartet Chelsea Bridge and I've missed it. This is an independent release, so check out Mott's site for details about distribution. Unlike Mott, trumpeter Nathan Eklund is a new name to me, but the presence of saxophonist Donny McCaslin caught my eye in the credits. McCaslin is as strong and lyrical here as you might expect, but guitarist John Hart and bassist Bill Moring – also players I'm not familiar with – are also very impressive. Eklund wrote all 10 compositions and exhibits a nice touch with tuneful material that sticks immediately inside your head. Drummer Tim Horner keeps a crisp edge on everything with his light, responsive touch on cymbals. 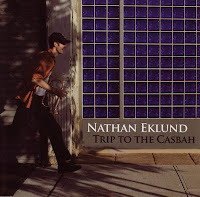 Eklund is a very melodic player with a sound that seems rooted in Clifford Brown moreso than in more contemporary players. Definitely someone to hear more from. 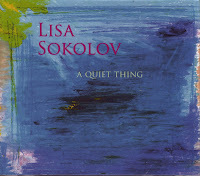 Singer Lisa Sokolov's last recording is one of only five that I've given the maximum five stars to in DownBeat magazine during the past 10 years, so this followup is one I've been looking forward to. Sokolov is a highly distinctive, emotive vocalist – and, as response to my review of her last album indicated, a taste not every listener can acquire. A Quiet Thing is not going to change your opinion of her. If anything, her singing here is even more highly mannered than last time out. Her take on "Lush Life," for example, put me in mind of Jimi Hendrix's "Roomful Of Mirrors," as Sokolov acts out what sounds like narcissistic psychosis; each phrase seems to betray a different aspect of the subject's despair. It's so outré that I'm not sure I'd be drawn back to it quickly, but that's the danger of pieces that are closer to performance art than mere delivery of a lyric. Like Nora York and – to a somewhat lesser extent, Kurt Elling – Sokolov inhabits a song, and when the subject matter is disturbing, as Billy Strayhorn's lyric is at its core, the performance can be disturbing, too. It's powerful stuff, though, and certainly no less affecting than her previous disc; Sokolov has tremendous control over her instrument. Definitely something you need to be in the mood for. Two great stories in the news today about vital, New York-based saxophonists who have fought back from health issues. David Adler has a post about the return of Mark Turner, who suffered a serious power saw accident last year. Meanwhile, on the New York Times site, Ben Ratliff reviews a set by Andrew D'Angelo's new band – his first new project after life-threatening brain cancer, which struck him exactly a year ago. Terrific to have both of them back. Update: Mark Turner talks about his accident and rehabilitation on this interview with Josh Jackson of WBGO radio in Newark, N.J. So far, we've chronicled festival suspensions and sponsorship woes, but today brings bad news on yet another level: poor ticket sales. Last week, Cassandra Wilson won a Grammy Award; this week, she can't sell enough tickets in Portland to justify staging a double bill featuring her and another award-winning act, Jason Moran & The Bandwagon. "In my 31 years as a jazz presenter this is the first time I have been faced with such an arduous decision," said Portland Jazz Festival artistic director Bill Royston in announcing the cancellation. Wilson and Moran were scheduled to perform as part of the festival's tribute to Blue Note Records, marking the label's 70th anniversary. "The economic downturn has loomed large over this year's event," said Royston, referring to the earlier loss of the festival's previous title sponsor and last-minute rescue by Alaska Airlines. Jazz Journal billed itself as "The World's Greatest Jazz Magazine." It was certainly among the longest lived, publishing continuously since 1948. Like DownBeat, Jazz Journal was also a family business, and like DownBeat before it, Jazz Journal is now facing closure due to a death in the family. The death of Janet Cook, associate publisher and wife of publisher and editor-in-chief Eddie Cook, has led Eddie to decide to close the doors. In his announcement, Cook left open the hope that someone would rescue the magazine – as happened with both DownBeat and, following the retirement of Bill Smith, Coda – but no white knights have stepped forward yet. If you live in a winter-bound place like me, the concept of summer begins to look very good just about now. Even with a long weekend approaching, the cold days stretch out ahead without much relief in sight. Best, then, to think of warmer days and summer jazz festivals. From this vantage point, it looks like this summer is shaping up to be a decent one for the North American festival circuit. The Maria Schneider Orchestra is hitting the road, which is always a good thing, and the band has already announced dates in Toronto, Ottawa and Montreal. Sonny Rollins will be around, as will Wayne Shorter. Enrico Rava and Stefano Bollani will be playing duets in a number of cities, including Montreal, and Gary Burton has announced a tour for his "Reunion Quartet" with Pat Metheny, Steve Swallow and Antonio Sanchez. As far as younger players, like The Bad Plus, Brian Blade, Kurt Rosenwinkle, et.al., no solid word, but that's the stuff that winter dreams are made of. After last year's stunning upset by Herbie Hancock it was inevitable that jazz would return to its usual position as poor cousin at this year's Grammy awards, but we had our year in the sun. Francis Davis for best liner notes for his contribution to the Kind Of Blue anniversary package. Randy Brecker for his Brazilian recording. Cassandra Wilson for Loverly, which I thought was far from her best work. Gary Burton and Chick Corea for reprising Crystal Silence. The Vanguard Jazz Orchestra for their live recording. Arturo O'Farrill and his orchestra for his tribute to his father. Terence Blanchard for his solo on "Be-Bop"
Jack DeJohnette won the Best New Age Recording category for his record Peace Time. 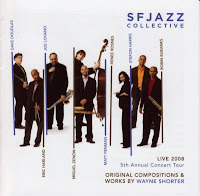 Last February, I caught the debut show in the SFJAZZ Collective's tour of their Wayne Shorter program in Portland. As noted in a couple of places on Jazz Chronicles I found the show wanting. It struck me as too brash and loud given the material being played, and several of the arrangements sounded cluttered. But how could a band with this much talent – Stefon Harris, Miguel Zenón, Joe Lovano, Robin Eubanks, Matt Penman, Dave Douglas, Renee Rosnes and Eric Harland – sound less than stellar? I've already admitted that context might've had something to do with it (I left the SFJAZZ Collective show for a highly textured performance by Myra Melford's Be Bread that wound up being one of my favourite shows of the year), and it was the first show on the band's tour. Given that I have a ticket to see them in Ottawa on March 1 – for their new tour, playing a McCoy Tyner program – I thought I'd check out the recently released three-CD set of the 2008 tour, which is available only by mail order from SFJAZZ. Notably, there are no performances from the Portland show; rather, it captures 17 pieces – nine Shorter compositions and one by each of the band members – recorded at eight concerts, beginning 11 shows after the Portland set I caught. The band can still hit hard, befitting an octet with three brawny horns in the front line and a drummer as exuberant as Eric Harland, but these discs reveal a number of nuances, like the way the rhythm section dances lightly behind Eubanks' solo on Zenón's arrangement of "Armageddon." Lovano strikes a minimalist note on his approach to "Infant Eyes," painting light strokes on tenor with just Harland's brushes as accompaniment, and Douglas' "Secrets Of The Code" has the solo acerbic trumpet lead and suspended time you expect from him. There are surprises, too, not the least of which is Douglas' arrangement of "Aung San Suu Kyi," the most recent of the Shorter compositions in the band's repertoire. While Shorter usually imbues the piece with mystery and performs it with dramatic, slashing shifts in dynamics, Douglas transforms it into a joyous celebration with allusions to New Orleans parade music. Shorter purists may still balk at raucous interpretations like Rosnes' arrangement of "Footprints," but that's the price of turning personalities as strong as these loose on music filled with both inspiration and room for liberal interpretation. Given the range of this band and its potential to unleash enormous energy, I'm looking forward to what lies ahead for the Tyner material – particularly if they dig into some of his rich catalogue from the early '70s.